Hamid Malik’s family hails from the Indo-Pak Subcontinent, but he was born in Karachi in 1948. He came to the United States in 1970, and in just over a decade founded Amtrend. Hamid was renowned for his dedication to his work, coupled with high business ethics. Regardless of how tired and busy he was a day earlier, he would always arrive at his office on time to set an example for his 90+ employees. He strongly believed that leadership was more than just rhetoric, and incorporated that same pragmatic and rational philosophy to all aspects of his life. 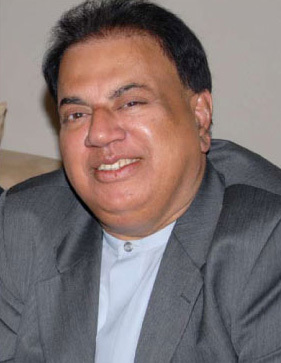 Politically and community-minded, Hamid spent as much time organizing fundraisers for various local political candidates at his gracious home or in public places, as he did arranging interfaith meetings to diminish differences amongst religious groups and ensure that harmony could prevail at all levels. Outside of his family life, he helped many organizations financially and as an advisor while they were trying to achieve their agendas by using his contacts in the Consulate and the Embassy in the United States. Today, sons Shawn and Waseem carry on their father’s vision, passion and unrelenting dedication to excellence, leading Amtrend into the next chapter of its story. From the manufacturing process to packaging and shipping, Amtrend incorporates energy saving practices into its day to day operations. Firstly, Amtrend has a program in place to regulate heating and cooling for their 50,000 sq. ft. facilities in Fullerton, CA. The hours of operation are scheduled to take advantage of seasonal weather opportunities, with special attention paid to California warnings and bulletins as they relate to heat index, electric power pressures, water conservation and more. In the specific components used in manufacturing, there are limited ways that Amtrend furthers conservation, such as using plywood in frame construction as opposed to renewable hardwoods. Hardwood requires kiln drying to be strong but incurs greater energy usage. Plywood fabrication meets the price points required by customers and extends the life of the product, but it also allows for less waste and greatly reduced shipping. Amtrend seat cushions are made of high density, 8-gauge steel sinuous springs. Cushions are made of high density, 1.8 lb. HR Endurofoam that contributes to long life, and addresses safety issues by making sure that every cushion is flame retardant. CMHR foam also ensures additional inflammability. In our packaging, Amtrend takes extra effort to promote blanket- wrapped shipping to avoid the overuse of corrugated cartons and other types of packing materials that may be detrimental to the ecosystem, while still promoting the safe delivery of all manufactured goods.